In this vast and ephemeral city, short on tradition and long on illusion, the thirst for a permanent legacy—for a taste of fame that exceeds 15 minutes—consumes us all. Superstars get their names in the Hollywood cement. Vandals settle for spray-painted glyphs on the 101. Philanthropists boast eponymous museums, while the merely self-absorbed turn their license plates into personal brands. 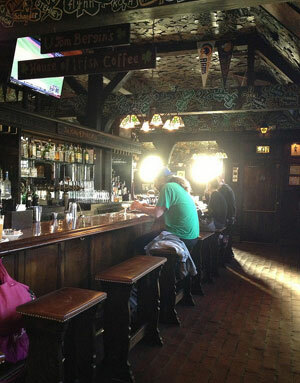 For the rest of us there is Tom Bergin’s, the Irish pub on Fairfax, which offers immortality for the price of a beer. Actually, 15 beers. Or more precisely, 15 visits, which means something like 30 or 45 or 120 beers, depending on your drinking habits. But who’s counting? To sip a pint of stout at the perfectly horseshoe-shaped bar, all oak and brass and lead glass, is to defy nearly a century’s worth of trends and fashion. 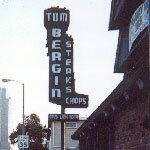 Bergin’s opened in 1936 and moved to its current home, just south of Wilshire, in 1949. Since then the loyalty of steady drinkers has been rewarded with custom shamrocks, cut from cardboard, hand, painted with the patron’s first initial and last name, then stapled, like wallpaper, to every inch of the room. At last count there were 6,327, the newest still minty green, the oldest lost under a nicotine crust. Cary Grant has one. So does Tommy Lasorda. Most, however, bear the names of otherwise anonymous drinkers, men and women whose hours of bibulous escape have been recorded here for posterity. This summer I joined their collage. I arrived with half a dozen colleagues, all of us a bit giddy as we ordered our pints. Would there be hushed silence? Or bells and whistles? I handed my confirmation letter to Chris, the white-haired bartender with the Dublin brogue who is said to have inspired the creators of Cheers. He glanced down at the page, then up at me. “What’s your name?” he asked. Fifteen visits in seven months, I had to admit, does not a regular make. My real achievement was that I had been fastidious enough to carry the card—alongside my grocery and fitness and video memberships—and usually didn’t down so many beers that I forgot to get it stamped. Chris dug around in the back for a few minutes. When he returned to the bar, he was carrying my shamrock, handsomely carved from a carton of Woodpecker English Cider. J. KATZ was painted across the clover in careful white brush strokes. How cool was this? My friends signaled their approval with a toast. “We’re ready whenever you are,” I told Chris. A half hour went by, and the crowd around the old oak horseshoe started to swell, oblivious to my crowning feat. I was certain all eyes would be on me soon. Another half hour and still I waited. I flagged down Chris. “Is there something else I’m supposed to do?” I asked. My induction was performed by a busboy. It was my job to point him to an unoccupied spot in the mosaic—no easy task—while he followed with a ladder and a staple gun. I craned my neck high and low until I caught sight of a bare patch right above the front door, just to the northwest of a certain D. SKOG. Such a visible location surely had to have been claimed years ago. It probably was, the busboy said. But cardboard shamrocks have a tendency to grow brittle and break loose after a few decades. “Whose used to be up there?” I asked. Nobody knew. I seized the vacancy. By L.A. standards, that’s still a timeless pantheon.